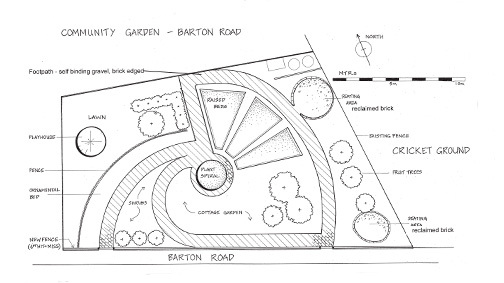 It’s been a long time coming but we’ve finally got planning permission to turn a small parcel of land into a community garden in Farnworth, Bolton. Initial clearing and digging of pathways was done by a group of fabulous Prince’s Trust lads. We then got Ambec Fencing to come along and install a new fence along the front and back borders of the property. The right hand-side faces onto a cricket club and on the left is Bolton at Home residential housing. The project has been funded by Symphony Housing and is going to create a garden filled with lots of things including a playhouse, raised beds for growing vegetables, composting area, sitting areas, flower beds and fruit trees. However there’s lots of digging and landscaping to be done first made much harder by the fact that a rubbish tip and half a housing estate seems to be buried under the ground! Digging goes something like this… put your spade in an inch, hit something, dig around the two bricks you’ve struck, remove them, try putting your spade in again, hit something different this time, discover a black bin bag of rubbish, dig it out, try again and hey presto – you finally get to something resembling soil! We’ll also be creating some art with local communities to put in the garden – this is likely to include mosaics and withy sculptures. Alongside this, we’ll be creating a film about the process which will include some timelapse. some animation and also some interviews with our willing volunteers and other local people. 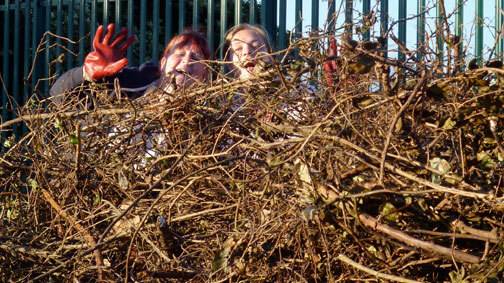 I’m currently working on a community art garden project in Bolton with Richard Dawson and Peter Castle. Having put in a (very long) proposal which took us about two days to complete, we got asked to attend an interview, which was then followed up by an ‘interview workshop’ when the interviewers (which included a community member) couldn’t decide between us and another group. We were paid to carry out this workshop, which I thought was a really positive approach, as I know many artists who have been expected to deliver a workshop for free as part of the interview process. I’d be interested in hearing what other people think about the application and interview process for artists. You are often expected to submit a comprehensive proposal as an initial application, which can easily take a day or two to put together, and then attend first and second stage interviews, which might include a presentation, with perhaps a workshop thrown into the mix too. All valid methods for finding the right person for the job or is it taking the selection process a bit too far?